Origin and etymology: introduced, from China, in 1869, by the abbot Armand David (1826-1900), missionary and French naturalist, hence its Latin name (Davidia involucatra). The first planting in France was in the arboretum of Barres (about 100 kilometres South of Paris). 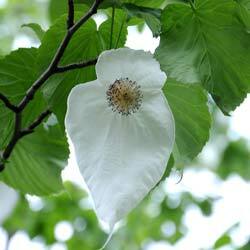 The name "Dove tree" comes from the long bracts, which hang of the flower in spring, as wight wings of dove. Form (insulated tree): broad of a pyramid. Several trunks. Deciduous leaves, alternate, heart-shaped base, strongly toothed, ended in tip. Length: 12-15 cm. Yellow, small flowers, in May, concealed by white bracts, bigger than leaves (20 cm). They appear at the end of a dozen years. Purple fruits in the form of small pear (3 cm). They stay on the tree late in winter. Overripe, they are edible. either leave the dove tree grow in clump, or do you want to keep one main trunk, in which case you must eliminate secondary trunks around the trunk as vertical.